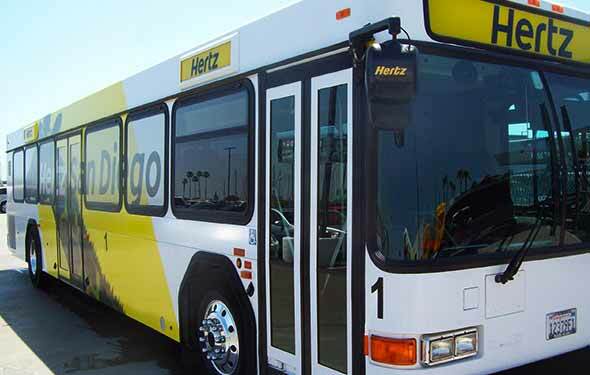 If you think airport courtesy buses are all alike, you haven't seen the Hertz Easy Access bus. Available at several Hertz airport locations. Low floor design - only one short step to climb. Easier to board - especially with luggage or small children. Electrically-operated ramp - provides easy wheelchair access. Handy waist-high luggage rack - eliminates the need to reach up for overhead storage. For anyone carrying a heavy bag, a bulky backpack or a small child, the ease of convenience of the Hertz Easy Access bus will be a welcome relief! At Hertz, we know exactly how you feel, so we have exactly what you need.